Amongst all the glittering lighting that we are known for, we also stock a small but unique selection of occasional furniture like shelves and tables, a few of which display beautiful work of art and skilled craftsmanship. We have some reclaimed oak which has been turned into beautiful pieces of contemporary furniture items. There are shelves created out of beautiful reclaimed oak. These are simple and minimal designs yet will look very clean and are quite practical. The beautiful oak bookcase will sit very well in any of the room and why only for books? These bookcases make great display units as well. Dress these up the way you wish and your room will surely not fall short of any charm. Apart from this there are also tables, chairs, sofas and other elaborate contemporary pieces to dress up your space beautifully. The best part of it all? Most of the items can be customized as per your requirements so that you do not have to worry about space constraints. 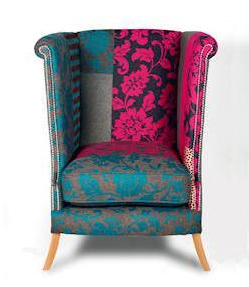 Latest in our collection of chairs are a range of art form chairs from Glimpze. Elegant wool and rich faux leather give it a splendid appeal. These latest acquisitions are your perfect examples of form and function. And the strong colours and patterns will make sure that there is a lively dash of colour wherever they are standing.